Despite the cartoonish CD cover illustration, depicting a smiling Laura Dubin seated at a grand piano, and perhaps giving the false impression that this is a jokey album, the music surely proves otherwise. This ambitious double album of a live performance on July 2nd, 2016 contains many surprising and engaging pieces. Opening with Steve Allen's "This Could Be the Start of Something Big" Dubin's style for standards is clearly influenced by the likes of Oscar Peterson and maybe even Dudley Moore. Dubin even includes a paean to her hero in the shape of "Ode to O.P." But the standards such as "I Got Rhythm" and "Prelude To A Kiss" are interspersed with an equal number of Dubin's own compositions. It's also easy to hear another major influence in her playing, the Iberian-tinged music of Chick Corea as evidenced by numbers such as "Thunderstorm," "Anxiety" and the barnstorming "Barcelona." There are no fewer than five sets of medleys, the marriage of Ravel's "Prelude from Le Tombeau de Couperin" with Rodgers's and Hammerstein's "My Favourite Things" is particularly effective and on CD 2 there's a melding of a Dubin composition dedicated to Bill Evans, "Waltz For Bill" with Cole Porter's "It's De-Lovely." For Corea fans there's a triple medley treat in the form of "No Mystery / Now He Sings Now He Sobs / Spain" which benefits from a clever arrangement. Both Dubin and Kieran Hanlon frequently insert quotes in some of the classical pieces re-interpreted here such as Beethoven's "Sonata No. 8," serving to enhance the interest in the performances and Mozart's "Rondo Alla Turca" is given a whole new lease of life with a near-ragtime feel at times. Dubin's obvious talent is augmented by her sidemen who prove to be virtuosi themselves and contribute far more to the performances than mere accompaniment. Check out Hanlon's exquisite arco bass solo on Dubin's "Kelly Green." 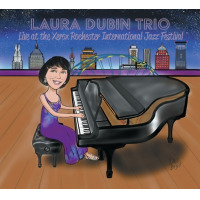 Dubin herself is equally accomplished as a pianist and composer and most importantly this trio can swing and keep the audience, their enthusiastic applause frequently heard at the conclusion of tracks, in rapt attention. Track Listing: CD1 This Could Be the Start of Something Big; Thunderstorm ; Ode to O.P. ; Prelude from Le Tombeau de Couperin / My Favorite Things; Prelude to a Kiss / Waltz Op. 64 No. 1 "Minute Waltz" ; I Got Rhythm; Handful of Keys ; Sonata No. 8 "Pathetique"; Green Arrow; Doc Z; Anxiety. CD2 Something's Cookin' ; Waltz for Bill / It's De-Lovely; Invention for Nina; New York; No Mystery / Now He Sings Now He Sobs / Spain; Kelly Green; On Fire; Reflets Dans L'eau / Our Love Is Here to Stay; Sonata No. 11 "Rondo Alla Turca"; Barcelona. Personnel: Laura Dubin: piano; Kieran Hanlon: bass; Antonio H. Guerrero: drums.